Flood waters like never before swept through downtown Montego Bay on Wednesday afternoon leaving in its wake flooded cars, businesses and homes and hundreds of millions of dollars in damage. Some communities on the outskirt of the city such as Green Pond and Porto Bello were also severely impacted, particularly the road infrastructure. The tourism sector was not spared as at least two hotels were invaded by flood waters. A video on social media shows tourists wading through inches of water. Businesses on St. James Street, Union Street, Harbour Street, Baywest Shopping Centre and William Street, experienced the worst cases of flooding. Scores of cars were swept away with some ending up on each other. The Rubis Gas Station on St. James Street, popularly called ‘Ken Douglas Gas Station’, took a battering after the North Gully overflowed its banks, converting the centre of the town into a virtual sea, with persons swimming and even using a boat in the waters. 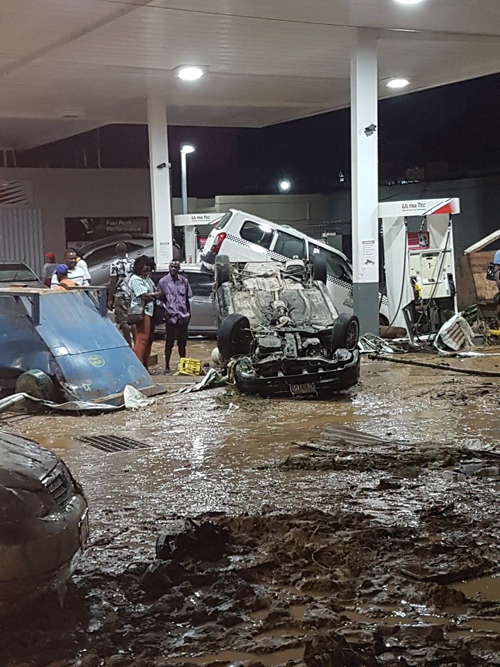 Flood water covered the pumps and several vehicles, which were swept away ended up on the compound of the station. Also taking a beating was the Star Wholesale and Supermarket on William Street, with almost its entire inventory ending up on the streets. Several persons were captured rummaging through the items discarded by the flood waters. Vehicles parked in the underground parking lots at Baywest Shopping Centre and Bisco Mall on Union Street were covered with water, some of them floating around like boats on the sea. Over in the community of Green Pond, in the vicinity of Birch Hill, residents were left cleaning debris from their homes as the gully overflowed its banks. One home, almost in the path of the gully, suffered major damage as the water swept through taking in its wake the retaining wall and gate. The gully, once several feet deep, resembled a well laid out and compact roadway, ready to be asphalted. The roadway was also significantly impacted with breakaways in several sections to include the main road leading to the populated community of Cornwall Court, which saw a number of homes in the scheme flooded. There was significant damage to the roads in neighbouring Rosemount, as well as the King Street and Salt Spring main roads. The Porto Bello/Irwin area on the outskirts of the city has been hit by land slippages and road damage. Porto Bello Drive is almost impassable with severe erosion of the roadway.